The Manhood Peninsula is a large peninsula of land to the south of Chichester. The name is thought to derive from the Anglo-Saxon maene-wudu meaning ‘common wood’. It has long been known as a particularly attractive area because of its fertile soils and its rich, varied natural resources. This popularity is borne out by concentrations of archaeological sites and findspots of all periods. Selsey (Seal Island) may have been the site of an important Roman and later harbour, now lost to coastal erosion. The palaeolithic, mesolithic and neolithic periods are represented by a handful of findspots of flint implements. There are no known occupation sites. Selsey Bill has a raised beach similar to, but younger than, the one at Boxgrove that has produced some of the earliest evidence of mankind in Europe. Limited excavations at Selsey have produced evidence of extinct large animals such as the straight-tusked elephant. Occupation sites, burials and field systems dating to the Bronze Age are known, particularly at Selsey. Examples were found during excavations in 2000-1 at the north end of Chichester Road. 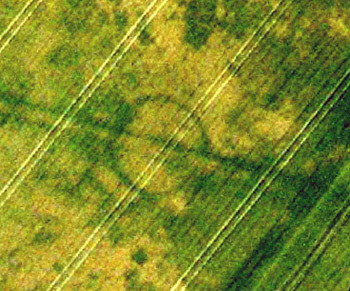 Aerial photography has revealed the cropmark of a possible burial mound at Birdham. Selsey has long been thought to be the site of an important Iron Age settlement. A large number of gold coins of the period come from the area and features seen during excavations at the former Pontins holiday camp in 1988-9 may be significant. The Romans have left far more evidence of their presence. Two villa sites are known, at Sidlesham and Selsey, and pottery turns up everywhere. There is circumstantial evidence for roads in the western Manhood. Excavation has revealed the line of the Chichester to Selsey road just to the north in Hunston. Limited middle Saxon settlement evidence has been found at Medmerry and lost place-names hint at wider occupation. The exiled Northumbrian Bishop Wilfred was apparently granted most of the Manhood, including a former royal residence, by the Saxon king Æthelwealh in the late 7th century. The Selsey war memorial contains several Anglo-Saxon cross fragments from Church Norton – considered the site of Wilfred’s monastery and subsequently the Anglo-Saxon cathedral of the diocese of Sussex. The peninsula itself formed a unit of late Anglo-Saxon administration known as a ‘Hundred’. The northern boundary was marked by a ditch known as ‘Brimsdyke’. A spread of medieval sites, mostly buildings, are represented in the archaeological record. The Norman ringwork at Church Norton is protected as a Scheduled Monument. Two deer parks belonging to the Bishops of Chichester are known, at Cakeham, where they also maintained a manor house, and Selsey. The Bishop’s rabbit warrens are recorded at West Wittering. The post-medieval period is represented almost exclusively by buildings of the 17th to 19th centuries. The 20th century has also left its mark, particularly in the form of defensive structures from the two world wars. 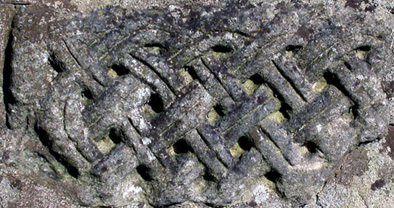 Anglo-Saxon interlace ornament carved into a stone in the base of the War Memorial at Selsey. It was found at Church Norton and may have come from the cathedral site. Photograph, copyright Chichester District Council. The probable site of a Bronze Age burial mound near Birdham is marked by a ring-ditch shown as differential ripening of a cereal crop. Aerial photograph, copyright West Sussex County Council. 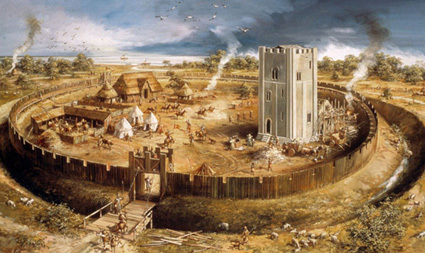 A possible reconstruction of the Church Norton site in the early Norman period. Original artwork by Mike Codd, copyright West Sussex County Council. 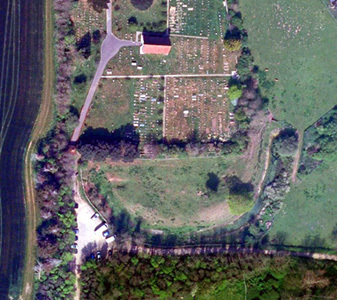 An aerial photograph of the Church Norton site. The chancel of the medieval church and its surrounding graveyard obscure the northern half of an 11th century circular defensive earthwork (the D-shape at the bottom centre of the image is the southern half). This may mark the site of the ‘lost’ Anglo-Saxon cathedral of Selsey. Aerial photograph, copyright Chichester District Council.